Shout! 's newest effort in the reissue campaign is The Singles Collection, a six-disc set of titles that were not originally released on DVD in the official numbered volume sets. Since they were selected for stand-alone release, it's no surprise that these episodes are mostly fan favorites. That makes this one of the most consistent MST3K collections that you're going to find. 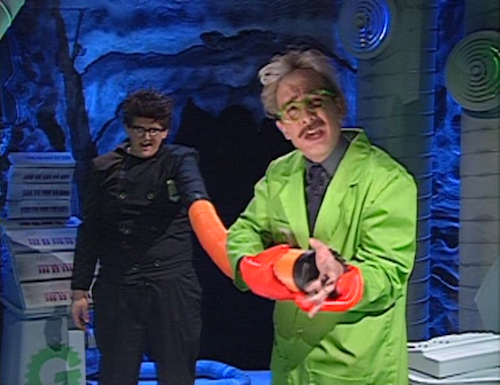 For those who are completely new to the series, allow me to cut-and-paste my show description from an earlier review here: A mad scientist, Dr. Clayton Forrester (Trace Beaulieu), and his daffy sidekick, TV's Frank (Frank Conniff), conduct experiments on a poor unsuspecting employee (show creator Joel Hodgson as Joel in the first half of the series; the series' long-time head writer Michael J. Nelson as Mike in the second half) by sending him out into space indefinitely, on a ship nicknamed the "Satellite of Love" (presumably after the Lou Reed song?) while forcing him to watch terrible movies, supposedly to "monitor his mind." The original test subject, Joel, was a handy sort of a guy, so he managed to construct a bunch of robots to keep him company. Crow T. Robot (usually voiced by Trace Beaulieu), a gold spray-painted collection of odds and ends, and Tom Servo (usually voiced by Kevin Murphy), a sentient gumball machine, sit in on the B-movie madness and trade heckles and asides that often incorporate pop culture references, both familiar and WAY obscure. The giant puppyish cyclops Gypsy (usually voiced by Jim Mallon) helps keep the ship running while the unheard, typically unseen Cambot... well... he records the show. Here's how this set breaks down. 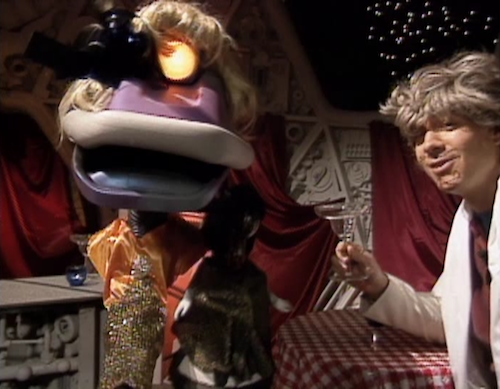 The first episode included here is The Crawling Hand (Episode 106), which originates from the show's first season on The Comedy Channel (before the network was folded into Comedy Central). Things feel a little different here, partly because the cast is not the classic cast. Joel is the host -- as he is on all the features included in this set -- but a young Josh Weinstein (who later changed his professional name to J. Elvis Weinstein, to differentiate himself from the Simpsons writer with the same moniker) appears on camera as Dr. Forrester's first mad assistant, Dr. Laurence Erhardt, and he performs the voice of Tom Servo. Weinstein has good comic instincts, but the show doesn't seem to fire on all cylinders with this crew. "Is there an abridged version of this movie?" "If so, let's burn it." The episode features more silly wordplay like that, and less of the show's signature pop culture references. Talking about the film's titular murderous appendage: "You gotta hand it to him." Also, this bit of nonsense: "He's not even sporting a dance belt. Or dancing a sport belt." The next episode in the set is based upon a film that doesn't make a lick of sense, but the episode is priceless. We're talking about the biker-sploitation flick, The Hellcats (Episode 209). Ross Hagen is a biker looking into the murder of his brother, with the help of his brother's fiancee. They encounter some motorcycle gangs. There's some fighting, some partying, some loving, and some scenes of characters nearly being ripped in half by bikes. Layer on some nonsensical biker slang, and you've got a misbegotten whatsit ripe for the takedown. Most of the host segments in this episode are flashbacks to bits from earlier shows, including a sketch from the Crawling Hand episode (Tom Servo notes it was "before my voice changed"). One presumes the show was still gaining a following at this point, so it's a nice little survey of the kinds of silliness the Satellite of Love crew can cook up between movie clips. The Christmas classic Santa Claus Conquers the Martians (Episode 321) is next, and this is hands-down one of the best episodes the show ever produced. The film itself is as bizarre as its title, with Kris Kringle kidnapped from his workshop by well-meaning aliens who want to bring joy to their children (including an extremely young Pia Zadora). Two Earth kids get kidnapped too, by an overzealous crew member who doesn't like the idea of going soft in the name of toys and happiness. Zadora's Golden Globe for Butterfly is oft-riffed-about, as is the whole cast's tendency to laugh like maniacs, instead of being convincingly jolly. The host segments wrestle with sentimentality and cynicism in dealing with the holiday season, with a Road House-inspired carol, "Patrick Swayze Christmas," being the absolute highlight. Moonraker's Richard Kiel, looking baby-faced even with a spirit-gummed beard, plays a caveman-out-of-time in another show perennial, Eegah! (Episode 506). Shoestring auteur Arch Hall Sr. casts his son as a would-be teenage rock 'n' roll hero, whose girlfriend has the misfortune to suit the fancy of Kiel's prehistoric abductor. Papa Arch also casts himself as the young damsel's father. Joel and the 'Bots often shriek in horror at Arch Jr's goofy mug or his character's mediocre musicianship. A low-energy instrumental is greeted with exhausted replies of "Tequila." A bad bit of post-dubbing led to one of the show's signature memes: "Watch out for snakes!" I'm also quite fond of this subtle Citizen Kane joke, spoken over a shot that is almost all ceiling: "Looks like Gregg Toland photographed this." Troubled youth is the focus of the set's final feature, I Accuse My Parents (Episode 507). While it's not as cartoonish as that infamous bad-movie staple, Reefer Madness, this flick subscribes to the same school of unsubtle sermonizing, by illustrating that -- wait for it -- lying is bad. Also, love your children and maybe they won't throw in with gangsters and end up with a murder rap. The lying and loving parts don't logically converge, but why would you want them to? The Ox-Bow Incident's Mary Beth Hughes plays a chanteuse who lights a flame in the wayward kid's heart, and has a nice set of pipes. During an inspired host segment, the SOL crew remake one of her nightclub numbers. Gypsy lip-syncs to the song, while the others constantly change wigs and costumes to play everyone else in the club. This flick is just over an hour, so it comes with a short (I love the shorts!) on truck farming. My favorite throw-away from this segment, delivered over a shot of a young migrant crop-picker: "A pre-teen is put to work. Her beauty will soon fade." And then, like the cherry on top of a delicious sundae, the final disc in the set is Shorts, Vol. 3, collecting seven educational and industrial shorts from various episodes. (Mike fans will be happy to know that he finally makes an appearance in this set, in many of these shorts.) Topics of the shorts range from water-skiing to bread salesmanship but, as ever, the SOL crew mock the blatant subtext of '50s conformity and consumerism. Good stuff! Mystery Science Theater 3000: The Singles Collection is packaged in a standard-sized keepcase, with 6 DVDs packaged on a few back-to-back hubs. 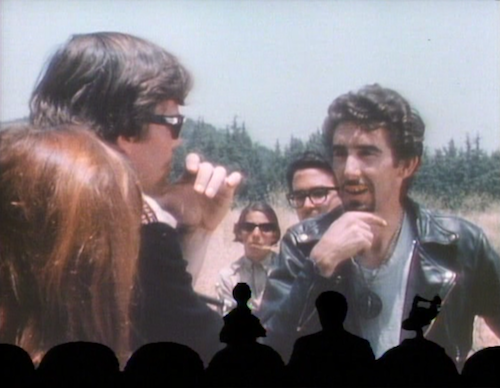 As ever, MST3K is not a show that looks or sounds particularly sharp. This is partly due to its early '90s vintage and partly due to the rarely-first-rate video masters supplied to the show for riffing. That said, the show's standard 1.33:1 video and Dolby 2.0 audio are perfectly watchable and understandable. No subtitles, but each episode has English closed captioning. The original Rhino DVDs included uncut, unriffed versions of the features. Those versions have not been included in these reissues. 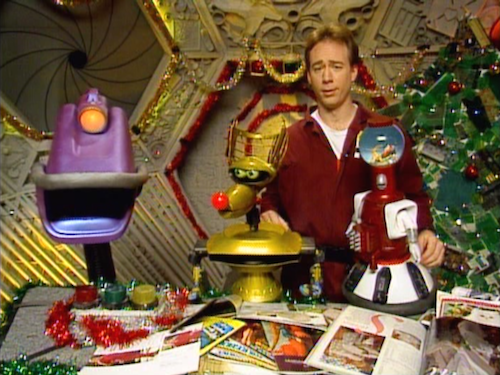 New intros on Santa Claus Conquers the Martians, Eegah, and I Accuse My Parents by Joel Hodgson (25:11 total) - Joel offers fairly lengthy recollections of three episodes. He remembers the impact that Santa Claus Conquers the Martians had on him as a child, before recounting how Mike Nelson's obsession with Road House infected the whole writing staff and became a runner throughout the Christmas episode. He talks about meeting some of the cast of Eegah years after the show aired, and how it gave him a more wholesome appreciation for the film. Finally, he talks about how the MST3K crew were at the top of their game during the time of the I Accuse My Parents episode. MST Hour Wraps for Santa Claus Conquers the Martians and I Accuse My Parents (10:35 total) - The bookending segments that Mike Nelson hosted (in heavy make-up) for the hour-long, syndicated versions of these episodes. Don't Knock the Strock (12:07) - A mixture of history and appreciation, in honor of The Crawling Hand and its director, Herbert L. Strock, courtesy of a few different historians. The Man on Poverty Row: The Films of Sam Newfield (23:29) - Another talking heads piece, this time tracing the career of director Newfield, who made I Accuse My Parents, as well as 270+ other films (including the infamous all-little-people western musical, The Terror of Tiny Town). By highlighting various styles of films that Newfield made, the piece also does a nice job of tracing the shifting zeitgeist of the B-picture business over the course of two decades. Trailers - for the first four movies, but not I Accuse My Parents. For long-time fans and newcomers alike, this MST3K set is a must-own. Some of the show's absolute best episodes are included here, and the newly produced bonuses, which offer show creator Joel Hodgson's reflections and provide history on some of the guilty parties featured filmmakers, are worthy additions. DVD Talk Collector Series.